Fair weather means anytime is a good time to watch the sky. The high Sierra Nevada is the place to really enjoy the show in summer camping out, but winter means snow is likely and a cabin rental might be a better choice, or grab a guest room at a rustic lodge like this one photographed above. Meteor showers are best viewed after 2AM, so you first need to decide if you are "a stay up late", or "wake up early" kinda person. Partying and drinking in the early evening means the excitement will be worn off and you will be dozing after midnight, missing the entire possibility of seeing any grazers. Taking a nap in the early afternoon before might help your odd sleep schedule adjust but be prepared to kick up the caffeine when you want to take in the awesome night views. Mount Pinos and Mount Abel are both popular SoCal spots for annual star parties - tent campers and motorhomes alike. Palomar Mountain is another fine alpine destination. Most all desert parks are excellent sites to view the night skies with minimal moisture the stars appear super brilliant. Mojave Preserve, Red Rock, Death Valley, Anza Borrego, Mecca Box Canyon, Joshua Tree, the list is endless. You might need to drive inland for clear night skies. Deserts are best. Alpine locations are excellent spots for star gazing, if it's not snowing. Why not keep the passion alive all year long. Take solo weekends away from one another and also vacation as a couple. All local, outdoors and on a budget. Kick your creativity into high gear and plan something totally spontaneous: Get a cabin or condo on the slopes for a few days. Book a lake view suite at a small resort, read, relax and fish all day long. Walk in the forest, bring a picnic and lay out to stargaze at night. Travel locally to enhance your love life, snuggle up close to a cozy fireplace, with a good bottle of wine. Hike, bike and enjoy the outdoors. Local small towns in California is what Total Escape is all about. We have only small, independent lodges, but focus more on bed & breakfast inns, camping sites and cabin rentals. Discover more, stay local, spend less and enjoy your honey pie more often. One of the best camping lakes in California. Any lake near Gold Lake is prime pickens. This picturesque lake called Sardine Lake, or Sardine Lakes, is located within the Lakes Basin Recreation Area, north of Gold Country Highway 49 next to the peaks of Sierra Buttes and in between Tahoe National Forest and Plumas National Forest. A two tiered water storage in granite basin bowls, with the larger upper lake situated up above at the base of the mighty granite spires of the Sierra Buttes. Very impressive views all around the Gold Lake highway. nearest town: Sierra City California, on Historic Hwy 4. Frasier Falls, Gold Lake, Long Lake Trail, and Sierra Buttes are just a few of the area attractions. Lake fishing, camping and hiking are the main recreation in warmer months. Snowmobiling is popular around here in deep snow winter conditions. 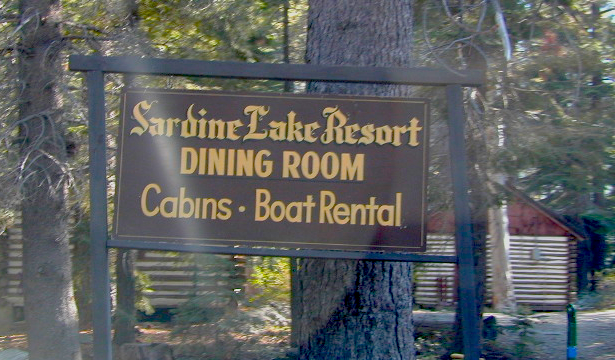 Sardine Lake Resort and Cabins is the only business on Sardine Lake. 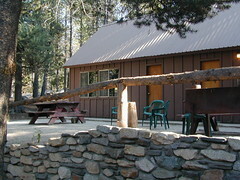 It is one of many small, independently owned rustic resorts in the Lakes Basin area. No chain hotels near here! California has the most amazing and diverse terrain you can imagine. Ancient lava beds to dense forests, giant boulder rock outcroppings to sand dunes. Off road motorcycles, otherwise known as 'dirt bikes' can find riding trails near home or across the state, in far away locations. Dirt biking off road trails can be found outside of nearly any urban city in California. In National Forests, on BLM lands, all across the many deserts and in a good portion of the mountains. The Sierra Nevada mountains located in the middle of the state has many high elevation OHV routes to small alpine lakes and primitive camp sites. SoCal has the winter prime-time desert warmth, Central Cal has coastal dunes, steep canyons, and rugged foothills, plus the giant Mojave desert which stretches from Joshua Tree area to Vegas. NorCal has the endless forests, solitude and rivers you seek. 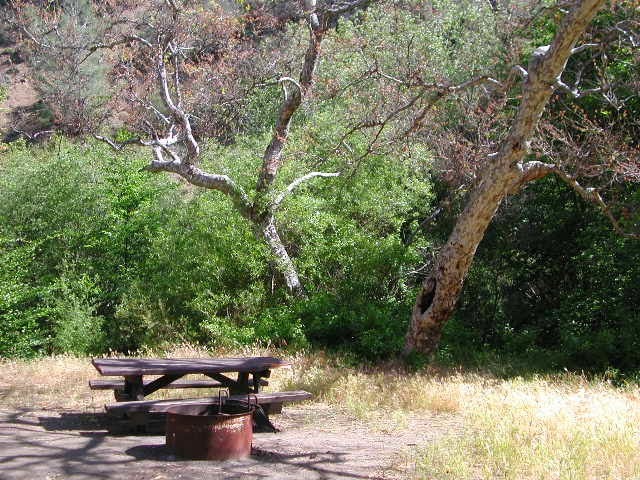 With the California population nearing 40 million, you will need to do your research in order to find a good, secluded, scenic camping area. Coastal camp sites are the most popular on the list and you should seek advanced reservation w/ the State Park system. City camping is mostly RV parks and a few county parks. Beyond the neighborhoods, countryside camping in the coastal foothills are limited to a few county parks and State Parks. All these areas mentioned above are also heavily populated, suburban sprawl and highway dense. So as you can see, this leaves us with the mountains and the deserts. These are the two regions to concentrate your outdoor vacation searches for SoCal. Below are some of Total Escape favorite destinations for camping in the lower portion of the state. Some may be developed campgrounds with fees, some are primitive camps without fees and a few are free camping area. The snow is minimal, water is scarce, wildfire danger is high, so campfires are usually limited to developed campgrounds only. Mountain locations in southern California range in elevation from 3000' above sea level to towering 11,500' at San Gorgonio Peak, which is the tallest peak in the region. Vast miles of tree-less lands in eastern California are considered desert terrain, which sees less than 10 inches of precipitation per year. High deserts (over 2000' elevation) as well as low desserts (under 1000' elevation) with awesome geological formations, open sandy washes, mud caves, slot canyons, indian petroglyphs, giant boulders and wildflowers are just a few of the sites to be seen. Snow is possible in California deserts starting around 4000' elevation. Off road vehicles, 4x4, quad, dirt bike, ATV riding spots are commonly referred to as OHV (off highway vehicle) use areas are plentiful in desert regions. If you seek free tent camping, private creeks, plenty water, seclusion on dirt back roads with spectacular scenery, alpine lakes with granite mountain peaks - then you must drive north several hours from Southern California - to reach the much more desirable Sierra Nevada range or NorCal mountains.